ISODODECANE, BIS-VINYL DIMETHICONE/DIMETHICONE COPOLYMER, CAPRYLYL GLYCOL, PHENOXYETHANOL, HEXYLENE GLYCOL. Silicone polymer forms a breathable film while this waterless clear liquid transforms any powder into an intense and easy to apply liquid. Paraben Free Formula. Not tested on animals. And does the same thing. What I like about this product is that it contains less ingredients than its contender, which I'd like to believe might be better for your eyes or any other place you use it. And this is a better value, allowing you to get 1 1\2 times the amount for less than the price of one MUFE aqua seal bottle (retails for $21, last time I checked). The only slight difference I find between this product and the MUFE is that MUFE dries a bit quicker and very hard. You have a little bit more time working with Duraline. I don't use this to "rehydrate" my gel liners though. I purchased isododecane, a top ingredient in many water proof cosmetic formulas, at very low cost ($4 for 4 oz). This works like a charm with any cracked, crumbly, dried out gel liner. A few drops added to marinate in the gel liner for less than ten minutes, and it's amazingly brand new and almost better than before. I get more pigmentation out of my gel liners, surprisingly. It's very simple, and the bottle I have will last for decades, as it has a very long shelf life. Hey dolls! As you all know (and if you don't you will now) I work for Inglot Cosmetics... I wanted to review this products because I feel like its a MUST HAVE! Why? Well for starters it's super affordable. Sadly, my stores is always selling out of this stuff, lol. If you don't know what a mixing medium is, well it pretty much turns anything into liquid. Pigments can now be used as a liner.. it also helps a dried up product come back to life. Awesome awesome awesome stuff. As everyone else has said, this turns powders into liquids and revived dried-out gel liners. I've used this as a base for glitter and custom matte lip colours. It is lip safe (make sure the pigment you're using is too!) and it lasts throughout a shoot, making it a great alternative to lip gloss. BEST liquid primer for eyes EVER! LOVE Duraline! It's the most amazing primer you can use when applying loose pigment shadows. It catches everything so there's no fall out and it lasts forever. I used it under a Makeup Geek pigment and it lasted well over 24 hours. It really helps bring out all the intense colors you wouldn't see in loose pigments if you didn't use it. You get a very bold multidimensional look, you can see every shade in the pigment. It's amazing. It goes on easily, it's very light weight, a little goes a long way, and you don't feel any type of stickiness on your eyes. You can't even fell that you have it on. I love it. Without Duraline all the loose pigments I've invested in would have just sat there unused because I couldn't really see anything that stood out in my loose pigments. But when you use Duraline as a primer, it just changes things entirely. It even works with regular pressed shadows and just brings out that color that you fell in love with. Holy Mother of Mixing Mediums! I heard great things about this product, but I didn't have much of a reason to get it until recently. I bought Inglot's AMC Gel eyeliner in 77 (black) and loved how pigmented and intense it was. However, it seemed to dry out quite quickly, less than a month after I got it to be exact. It would apply in a chunky fashion, was draggy on the skin, and dried too quickly to apply in the thick, dramatic cat-eye look that I like. But then I bought Duraline, applied just a drop to the gel eyeliner, gently mixed it in, and like magic it turned my AMC gel eyeliner into almost a liquid eyeliner formula without changing the intensity of the pigment. Basically, it turned it into the blackest black liquid eyeliner which easily creates sharp but smooth lines and dries to an almost bulletproof finish! I am floored! I haven't tried it with any lose pigment yet, but I have high hopes. Since you only need a drop, this little bottle should last ages; plus I love the button on top of the cap that helps dispense the liquid. 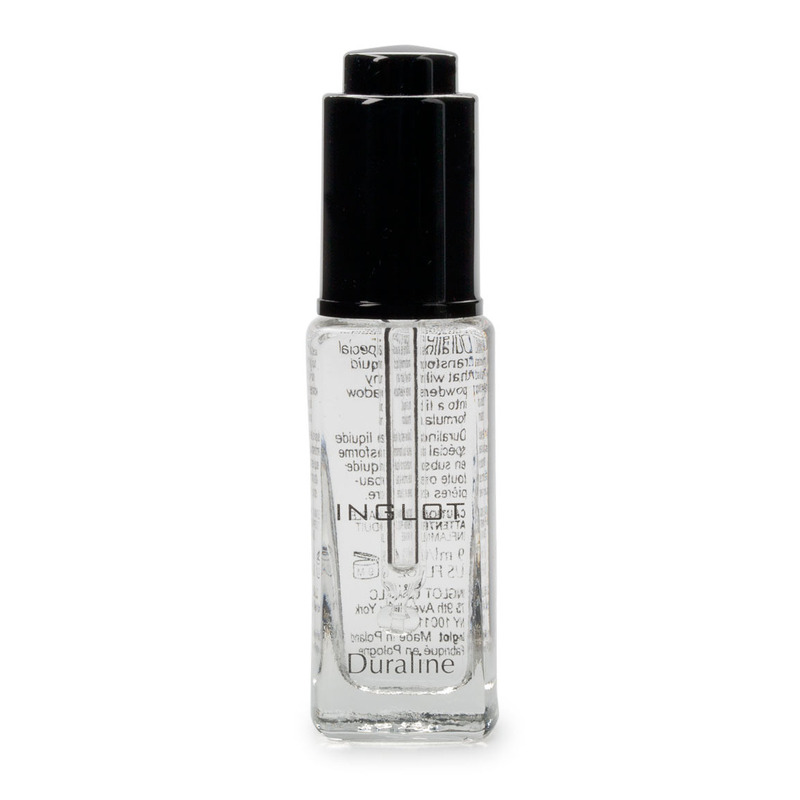 Duraline is something we are ALWAYS sold out of at INGLOT Aventura!!! This is an awesome mixing medium that not only waterproofs what it comes in contact with but also keeps the product true to color and finish. This product is also great for those of you who do NOT use INGLOT gel liner (which is a shame cause it is by far the best gel liner ever) but another company's such a black track from MAC that tends to dry out due to poor packaging or maybe you accidentally left it open. Mix in a drop or two and your gel liner will be good as NEW!!! This is possibly the neatest stuff in the world. It's so easy to use and works with any eyeshadow! I'm no longer limited to just the basic eyeliner colors I can find. I can now enjoy this beautiful trinket and every day is a new color opportunity! Get your mitts on this once you can. It's truly amazing. It's a mixing medium that can be applied to any powder or gel to make it into a liquid. Great for when your liner has dried out. Must have!